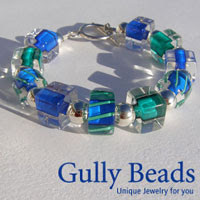 tinselmint: START YOUR KNITTING BAGS! What's better to get you motivated to knit than a new knitting project bag? My favorite kind of bag to use is a basic tote. They are perfect because they can have multiple uses and there's no fuss or muss (things can get caught up in zippers, Velcro and drawstrings). After my post on "WHAT'S IN A KNITTING BAG? ", a lot of you were asking "where can I get a good project bag?" so, I wanted to show you a couple of my project bags as well as a few options that I've been lusting after. My two favorite knitting bags I received as gifts. One is a basic cotton tote with the oh-so-popular "Keep Calm and Carry On" slogan printed in red on the front and the other is a light weight denim tote with a handy pocket stitched on the front. Most of the time these bags house my knitting projects, but I also like to use them for day trips, trips to the beach, and farmers market shopping. Here are a couple of my favs from Toronto based duo Geoff and Anabela who make up Fieldguided. Their handprinted totes are 100% unbleached cotton and feature fun text. How hip would you look carrying your knitting project around in one of these totes? The two above sell for $20. You can shop their entire selection online here. 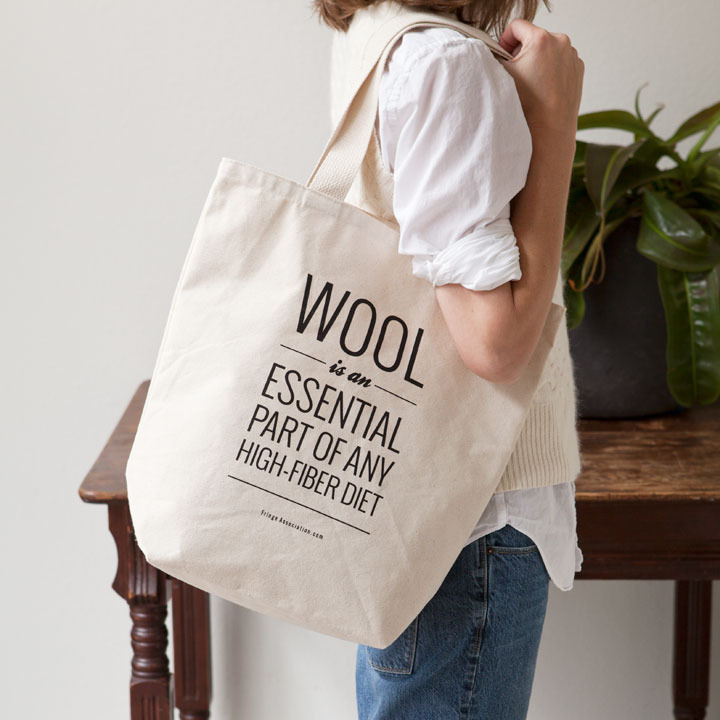 Another tote I absolutely love is this on from Fringe Supply Co. What makes this the perfect knitting bag is the reminder: "Wool is an Essential Part of Any High-Fiber Diet". Its 100% organic cotton to boot! You can purchase this "High-Fiber" Tote here for only $16. Also be sure to check out Karen Templer's blog Fringe Association. 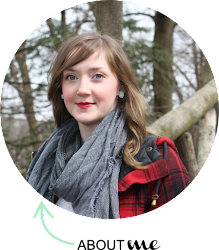 She has some great tips and interesting posts for all knitters! Last but not least, is this colourful number from Ravelry (an online community for knitters, crocheters, fiber artists and creators...also the number one resource for knitting patterns in my books). I love the wide strap for easy carrying on this tote as well as the graphic that features many of the tools and supplies you might find in one's project bag! Selling for $26, this "Notions" Tote is 100% cotton and features and inside pocket for storing small items that might otherwise get lost in the bottom of your knitting bag. You can find it here. I hope this helps any of you who are looking for a new project bag or at least provides a bit of inspiration. If you are feeling adventurous and you enjoy sewing the PurlBee has a turtorial on how to make your own here. What do you use for storing your knitting? Care to share? Tweet me @tinselmint or share a photo on instagram @tinselmint. I love hearing from you so be sure to leave a comment below and tell me what you think. I love the denim bag! Great tip on not to use something with velcro or zippers.